Strip bark, saw trees, dig roads and immerse yourself ankle-deep in water panning for the piece of gold that will make you rich. Such was the life of a gold digger. The gold rush brought people from all over the world, searching for their 'wealthily ever after', resulting in a population boom for Victoria and Australia. In Victoria, the Goldfields region encompasses the northern central section of the state including the major cities of Ballarat and Bendigo as well as the smaller centres of Daylesford, Castlemaine and Maryborough, going as far north as Inglewood. The architecture reflects the region’s rich gold rush history with exquisite gardens and grand public buildings. 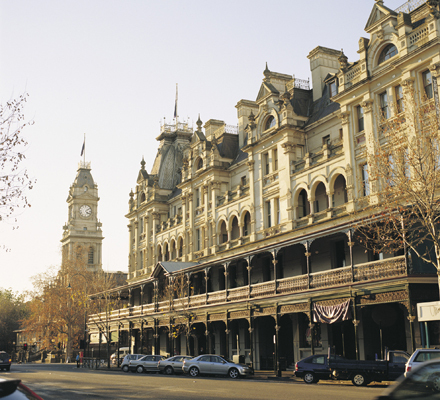 It has been said that Bendigo is one the most magnificent mid-19th century cities in Victoria. Obvious pride, remarkable buildings and elegant villas give you a sense of the affluence that descended on the town as a result of the gold rush. Bendigo had the largest goldfield in Victoria, extending over 360 square kilometres with 35 reefs. Fine art is housed in miners’ cottages as well as the Bendigo Art Gallery and the Central Deborah Mine shaft has been fully restored as a working exhibit to visit. Victoria’s largest inland city was born out of the gold rush. One of the greatest dramas in Australian history occurred during the gold rush with the Eureka Stockade remaining the only armed civil uprising against the government in Australia. Contemporary Ballarat showcases the town’s historic roots with a blend of modern culture. Make sure you visit the Royal Hotel where Mark Twain and Prince Alfred once slept, and the wineries that surround the town. However, perhaps what Ballarat is most famous for is Sovereign Hill, recreating an old gold mining town where you can see a demonstration of colonial bread making and blacksmiths creating shoes, watch in awe as an old fashioned printer prints a newspaper and you can even pan for gold. Situated between Bendigo and Ballarat, Castlemaine sits in a valley at the junction of three creeks. The historic streetscapes serve as a reminder of the town’s gold mining days with magnificent cultural buildings and fabulous architectural gems adorning the sidewalks. Wander through the home of Buda, a silversmith during the gold rush and meander through the beautiful gardens. There’s also the Castlemaine Gaol, built to house offenders during the gold rush era. Since it was closed in 1990, the gaol has been converted into a tourist attraction and hotel. Also well worth a visit is the Castlemaine Market Place which used to be a distribution point for food to the goldfields and is now a museum. Want to pan for gold and travel through the towns at the heart of the gold rush? Join Probus for the 2013 Rendezvous and sign up for the Post Rendezvous Tour with Trade Travel.